Celebrate 100 Days of School! Help your child recall moments and memories from her first 100 days of school. This Valentine's Day, your child can make a "Map of My Heart," a map that doesn't chart arteries and atriums, but her most treasured people, places, and things. Create a flurry of gorgeous winter snowflakes with this assortment of patterns! Give your child a fun outlet for learning world history with a fun paper project. He'll get to build the Great Pyramid of Giza, from Ancient Egypt. In the spirit of April Fools' Day, or just in the spirit of silliness, use these cut-outs for some good old fashioned googly eye bombing! Create the perfect paper snowflake with the help of this instructionable! Get acquainted with one of our nation's most famous buildings, the Washington Monument, by building a small paper model! Get into the spirit of science this Valentine's Day with some adorable science valentines! These cards are great for handing out to friends and classmates. Quiz your beginning typist on her knowledge of the computer keyboard with this blank template. She can even use it to practise her touch typing! Celebrate Martin Luther King Jr.’s life and message of peace and tolerance with this thoughtful, creative activity. Flowers and candy make the perfect Valentine's Day gift! Little love birds can cut out these flowers and add a lollipop to make a sweet Valentine's treat. Enjoy a coloring activity that can inspire your child to read more! colour your own bookmark with these cute bug and butterfly templates. Give your child a fun paper puppet project, and she can bring Little Red Riding Hood to life! 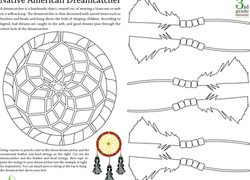 Help your third grader say goodbye to nightmares and welcome pleasant dreams with her very own Native American-style dreamcatcher. Create beautiful snowflakes every time with this helpful set of paper templates. Make an ordinary sheet of paper come to life with origami! This ancient Chinese tradition will be easy to learn with this how-to worksheet. Colour and cut out your very own New Year's Eve party hat! Have your little ones decorate it with glitter and ribbons to make it even more festive. Princes and princesses, learn to make your own crowns with this fun worksheet. Follow the instructions and be ready to play!